Mark one off of the Summer Fun List 2013 -- the one that I made with our preschooler, not my get-stuff-done-around-the-house fun list. Today we went strawberry picking with our good friends, and wow! the strawberries are AWESOME! The two of us picked nearly 7 lbs of berries, and G ate quite a few of his on the way home. We have so many and I know I want to try Strawberry Shortcake Scones, but I also have a weak spot for good homemade strawberry jam. Now, it is not secret in my house that I hate water bath canning -- too much hot water, stress, and time pressure, and then you never can be sure your food won't spoil and kill you. Hello, botulism! We bought a chest freezer some years ago, and it is one of my favorite large appliances. Why Can when you can Freeze? I freeze everything from casseroles to cakes to apple and pear sauce to sliced zucchini fresh from the garden. I have never made freezer jam before and today seemed like good day to try. Last year I bought several packets of Ball RealFruit Pectin for use with low or no-sugar jams. I used the recipe right off the back of the package, I already had a number of plastic Ball freezer 8 oz containers, and what household with a preschooler doesn't have unsweetened fruit juice? The longest part was chopping the strawberries -- the cooking was super fast. Combine strawberries and fruit juice in a 6 quart pot (I used by enameled cast iron dutch oven -- the heating is so even in this pot, the jam cooked up super quick). Add pectin. Bring to a rolling boil over HIGH heat, stirring constantly. You want the jam to keep bubbling even though you are stirring. Keep stirring! Add sugar, all the while stirring. Let the jam mixture keep boiling (as you keep stirring). Cook for 1 minute. Turn off heat and remove pan from hot burner. Ladle jam into freezer-proof jam jars (I used the plastic ones Ball makes just for this purpose). Let cool for 30 minutes (room temp), then put in refrigerator for up to 3 weeks, or the freezer for 3 months. If putting in the freezer, let thaw before serving. Makes 2 (8 oz.) half pints. As the weather heats up we tend to eat outside more than we eat in. Eating alfresco is one of life's simple pleasures, and I am game for eating on our deck, the neighbor's back porch, at the park, on a bench at a zoo, or sitting in a camp chair during lunch break at a dig. Something about eating outside makes food taste better, or maybe with fewer distractions we notice the taste of food more. This weekend we found ourselves at two different potlucks in two different venues. One was hosted by a colleague, where all food was inside, and we ate on the back porch. The second was hosted by our church was a large gathering, and food was served on folding tables under tents. All options were available for the first potluck since refrigeration or an oven were available. Not so for the second -- knew whatever I made would have to be stable at room temp for a good while. I poured over my stand-by recipes in cookbooks and on the web. I made two very different, but equally tasty, side dishes. Unfortunately, I did not think to take pictures of either, but trust me they looked as good as they tasted! For the smaller indoor/back porch potluck I made a version of Pimento-Cheese Spoon Bread with Roasted Summer Squash (original recipe here at Cooking Light). I mostly followed this recipe, though I used a box of Jiffy corn muffin mix and unflavored/unsweetened almond milk (and probably 3/4 cup vs. 1/2 cup). I always double the summer squash recipe -- when you roast those delicate squash they tend to really reduce in volume. It received high marks from all who tried it. The second was inspired be a recipe in a cookbook called the "Vegan Deli" + the Napa cabbage I got from our CSA + radishes in our garden + the fact that it was VEGAN and could sit at room temp. 2 apples (I prefer sweet Fuji), thinly sliced into "matchsticks"
Mix all of these together in a large bowl (don't worry, the volume reduces once the salad marinates in the dressing). Whisk the above ingredients together in a large measuring cup. Then, while whisking, slowly pour in 3 Tbsp of extra-virgin olive oil. Pour dressing over salad. Mix really well with salad utensils to coat every piece. This can be eaten right away (and so you can now add the Gingered Walnuts), but it is better if it sits for several hours or overnight in the fridge (in this case, do not add the walnuts until just before serving). Mix the walnuts with the agave to coat. Sprinkle with powdered ginger, stirring well. Transfer to parchment lined baking sheet (this is EASILY done in the toaster oven), and bake at 375 (or on the toast setting in your toaster oven) for 3 minutes. Stir, put back in oven/toaster oven for 3-4 minutes. Watch carefully -- you don't want them to burn. Remove from oven and let cool. As they cool they stick together in a peanut brittle formation. Use two forks to separate. Sprinkle on top of salad. Enjoy! "A Hint of Southern fare with a dash of French Cuisine." We started with appetizers -- olives and an amazing selection of cheeses for me, country ham jalapeno fritters for the others. That was followed by an amazing salad of local organic baby lettuces, roasted beets, walnuts, and blue cheese tossed with a light honey-cider vinaigrette. I was a little bit embarrassed how fast I ate my salad -- I was so hungry! The menu was slim pickings for vegetarian fare -- there were a number of seafood dishes, but I wasn't in the mood for fish or scallops (never a fave of mine). I discussed the situation with our serve and she suggested I allow the chefs to be creative. I did and found myself with a plate of yummy veggie sides -- in entree size portions. As I type this I am finishing up the leftover mashed sweet potato souffle, black bean cakes, roasted root veggies, & cauliflower and mushroom gratin. If you ever have a chance to go to Five Senses, it is worth the time and money. The website does not have their most up to date menu, but you get the gist of what they create. We declared today "FAMILY DAY!" This means we are headed to a local Pumpkin Patch and Farm this afternoon. The weather is G-O-R-G-E-O-U-S, highs in the upper 70s! We will need sunscreen for sure! We are so excited for G to see real tractors and pet baby goats. Batteries are charged and camera cards are emptied in anticipation! In anticipation of complete hunger and exhaustion that awaits later today, I am cooking up a huge pot of vegetarian red beans (New Orleans style). 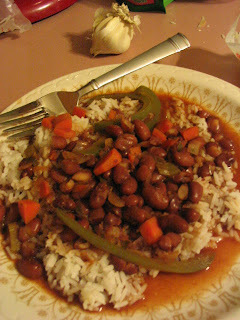 This is a "tried & true" recipe for me, and I have posted about it before. I made a few changes to my changes this morning -- I didn't have any carrots and couldn't go to the store (and didn't want to! ), so I sorted baby carrots out of a bag of frozen veggies and used those in the saute. I also used pickled garlic cloves because we are out of fresh. The pot smells wonderful and I am looking forward to dinner when we get home tonight! When I stop to think about what I eat for dinner most nights, well, I am sad to say it is "nothing" or "cereal." 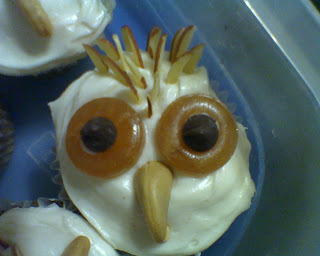 Between teaching late, feeding and bathing G, and getting him to bed, I am usually too tired to do much in the kitchen. Last week, I decided I really wanted salmon. We had asparagus and potatoes. Thursday was a light day for me at work, so I picked up a really nice looking piece of fish at Publix, picked up G, then headed home. Of course, dinner wasn't until after G was in bed, but it was well worth the wait. I originally thought I would make mashed potatoes, but that plan quickly went south -- no time and I have no idea where my hand mixer is. So, we settled for baked (with butter and LF sour cream, yum! ), and oven-roasted asparagus (super quick and tasty). I used a new recipe from the September 2010 issue of Cooking Light. My two changes -- I didn't use the regular chili powder, and used avocado honey instead of maple syrup (it was all we had -- a souvenir from California). I had to bake my fish for about 10 minutes at 350 degrees F in addition to broiling. I like it cooked all the way through. 2. Combine first 6 ingredients; rub spice mixture evenly over flesh side of fillets. Place fish on a broiler pan coated with cooking spray; broil 6 minutes or until desired degree of doneness. Brush fillets evenly with syrup; broil 1 minute. Many of the ancient civilizations of the Americas relied on maize, beans, and squash as staple crops and dietary foundations. All three are domesticated plants native to the Americas -- with the most likely origin in Mesoamerica. There are so many foods and dishes that maize is a part of. Add beans and squash, and no wonder they have been called the New World Trinity. I am watching my Florida State Seminoles compete against the Miami Hurricanes -- so a plate of Three Sister Nachos seems appropriate. These are not your typical pub grub. These are nachos that are mellow at their roots, but spiced up with chipotle pepper and Tabasco sauce (the chili pepper is also native to the Americas), these become gourmet bar cuisine. I roasted a very large (ca. 3-4 lbs) butternut squash, cooked a pot of black beans (always from scratch) with a couple of bay leaves earlier in the day. These came together super quick. Layer the tortilla chips on a paper plate or other microwave safe plate. Scatter shredded cheese over the chips. Microwave on HIGH for 45 seconds (depending on your microwave, may take more or less time). Scatter black beans on top of melted cheese. Sprinkle with cumin, black pepper, and salt. Scatter cubed squash on top of beans. Sprinkle with additional cumin (if desired), black pepper, salt, and chipotle pepper. 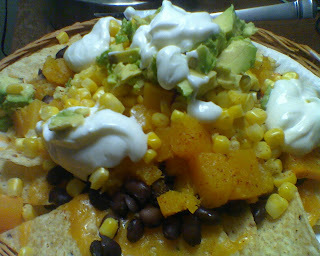 Scatter heated corn kernels and diced avocado on top. Place several dollops of sour cream on in middle and around sides. Serve with hot sauce of your choice! ** Apologies again for the low res picture. I cannot find the cord to my camera so am using my phone! We missed the birthday of one of G's daycare teachers -- I feel bad because I always try to bring them a treat for their birthdays. I decided we should make cupcakes for Mrs. C, but I wanted something different and not too difficult to make (since I am supposed to be working on any one of 5 papers that are due in the next week!). I came across a link to these on a blog, they are from the Land O' Lakes website. I used the cream cheese frosting recipe from the original LOL post, but added a good dose of cinnamon for extra yum. The cupcakes are an amalgamation of recipes, but based on a banana cupcake recipe from Cooking Light. 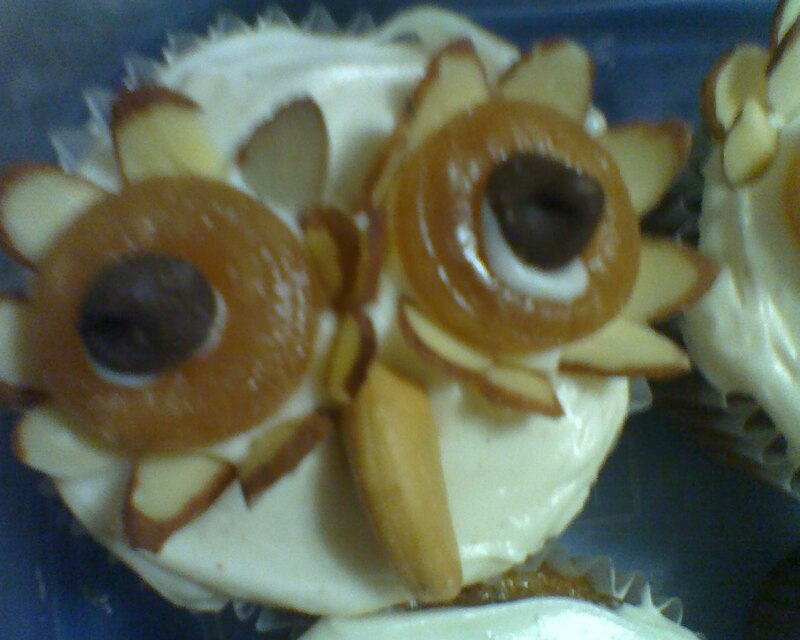 Here are the original recipes, I will post the cupcake recipe I used at the bottom. Beat the granulated sugar, butter, and 1 teaspoon vanilla at medium speed of a mixer until well-blended (about 3 minutes). Add eggs, 1 at a time, beating well after each addition. Add banana to sugar mixture, beating well. Add in ground flax meal, and mix until combined. Lightly spoon flour into a dry measuring cup; level with a knife. Combine flour, baking soda, salt, and cinnamon in a bowl, stirring well with a whisk. Add flour mixture to sugar mixture.Mix well. Add coconut and chocolate chips, stir to combine. Spoon batter into 12 muffin cups lined with paper liners. Bake at 350° for 25 minutes or until a wooden pick inserted in center comes out clean. Cool in pan 10 minutes on a wire rack; remove from pan. Cool completely on wire rack. I used the cream cheese frosting recipe from the Land O' Lakes website -- I did add in a good dose of ground cinnamon (and it was worth it!). I then directed the cupcakes as directed. 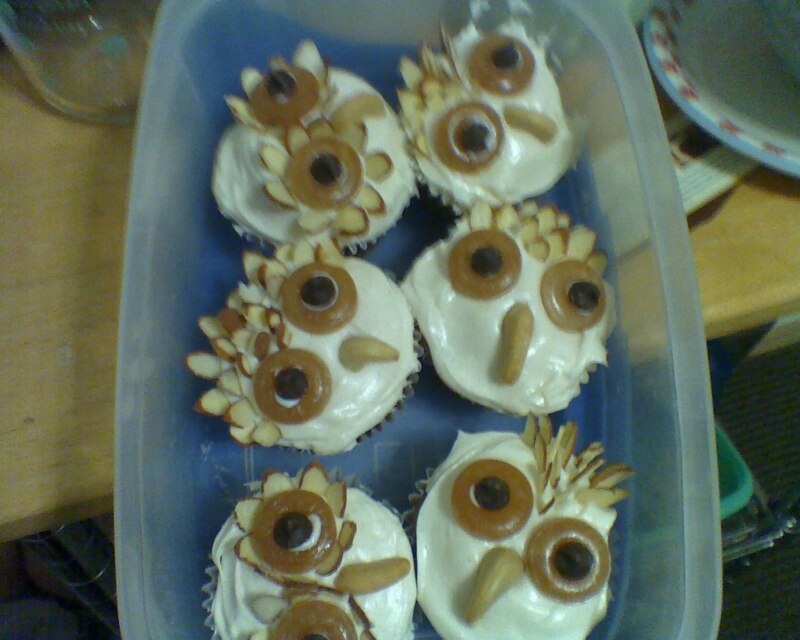 I used LifeSavers Butter Rum candies and semi-sweet chocolate chips for the eyes. *These pictures were taken with my phone, so apologies for the poor quality!